"To Pluto & Beyond: The Amazing Voyage of New Horizons" takes readers of any age on an exciting journey with NASA's New Horizon's spacecraft. This is intended for readers as young as 8, but can be enjoyed by all. With books about space and science intended for a young audience, there is a fine line between writing that's too complex and writing that older kids might write off as "babyish." Elaine Scott's "To Pluto & Beyond: The Amazing Voyage of New Horizons" strikes a perfect balance. The book, which details the history and journey of NASA's New Horizons spacecraft, explains the mission in an accessible way. It's appropriate for children as young as 8 but also detailed enough to be helpful and informative for adults. The spacecraft was sent to explore Pluto and beyond, and the excitement surrounding this exploratory mission is palpable in the pages even as Scott includes the technical details about New Horizons. In her book, Scott made sure to highlight the incredible contributions of women to the New Horizons mission. Women make up about 25 percent of the New Horizons flyby team. These stunning images show everything from the discovery of Pluto to the rocky objects that the New Horizons spacecraft was expected to encounter out in the solar system. Most striking are the images that the spacecraft itself took, like the photo taken of Jupiter's swirling clouds and Little Red Spot on the way to Pluto. While New Horizons continues to explore the solar system, Scott gives readers a clear view of the spacecraft's history and what it will hopefully continue to accomplish. Younger children could certainly appreciate this book, especially its images. But for parents with children 8 and older who want to learn a little more about space and how humans and spacecraft explore it, Scott's "To Pluto & Beyond: The Amazing Voyage of New Horizons" is a perfect choice. The language is unintimidating, and the journey that this spacecraft embarked on is undoubtedly thrilling. Learn a bit more about the book and the author here. 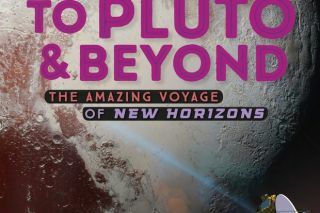 You can buy "To Pluto & Beyond: The Amazing Voyage of New Horizons" on Amazon.com.